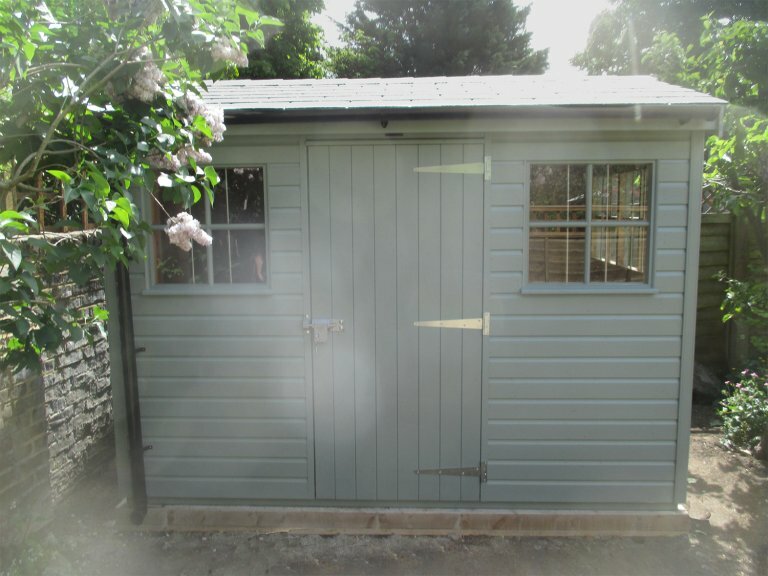 Measuring 2.0 x 3.0m, the shed is the ideal outdoor storage space with an appealing aesthetic. The apex roof is covered with grey slate composite tiles and the windows feature Georgian bars. Guttering has been added in order to protect it from the elements, and smooth shiplap cladding gives the exterior a pristine, contemporary look. The exterior paint colour was selected by the customer from our large range of paint finishes and is the shade of ‘Sage’. The customer also opted to add our security pack to the building, a reliable and hard-wearing solution that adds peace of mind with its stainless-steel window bars, non-returnable screws and heavy-duty, seven-lever sliding bolt lock. In order to take a look at our buildings for yourself, we recommend that you pay us a visit at your nearest showsite. We have several located across the UK, with one based in Staffordshire at the Trentham Garden Centre. 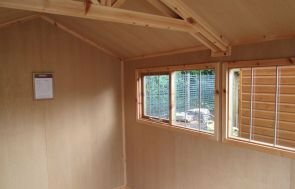 Here, you will be able to take a look at our vast array of display buildings and speak to a friendly advisor about your own requirements.